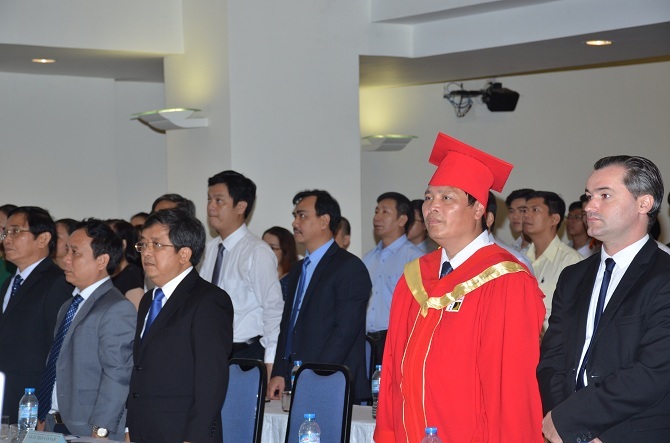 In the morning of May 26th, 2017, the University of Danang (UD) solemnly held the Conferment Ceremony of Honorary Professorate Degree to Prof. Dr. Tran Quoc Tuan – International Expert, Leader of project at Nuclear power and Alternative Energy Agency, CEA-INES, Francefor his contributions in training and science research activities of University of Science and Technology (DUT) in particular and UD in general. 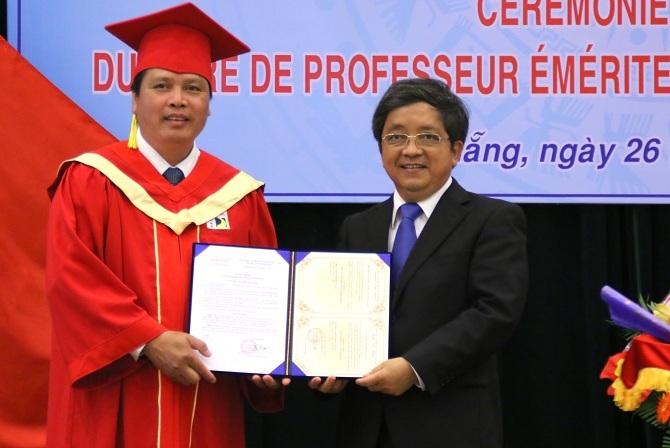 Prof. Dr. Tran Quoc Tuan finished his doctoral degree in 1993 at Grenoble Institute of Technology(France) and received the "Habilitation à diriger les recherches" (HDR), a type of accredited qualification to conduct research) in 2002 in France. He is also a senior fellow at Institute of Electrical and Electronics Engineers (IEEE). 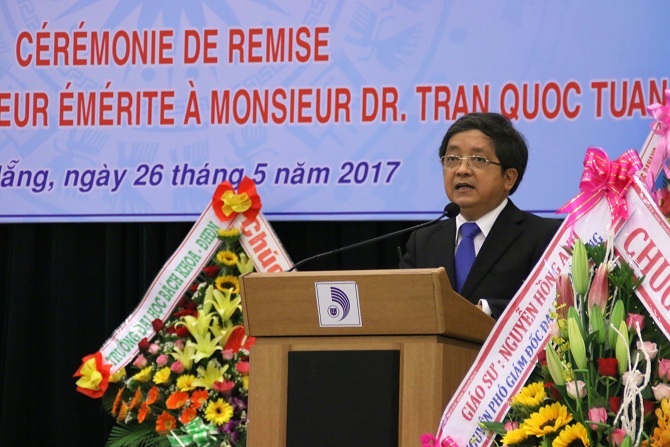 During the research procedure, Prof. Dr. Tran Quoc Tuan not only published 150 articles and scientific reports, 50 international patents, 50 research projects, but also chaired over 20 projects. As a co-curator at Grenoble Institute of Technology(INPG), France, Prof. Dr. Tran Quoc Tuan has made important contributions to the cooperative relationship between Vietnam and INPG over the past 10 years. He is also an advisor for the orientation and implementation of the High Quality Engineer Training Program in Vietnam (PFIEV), which is currently deployed at DUT, UD. Particularly for DUT, Prof. Dr. Tran Quoc Tuan directly instructed eight research fellows and co-published 24 articles and science reports. He also participated in a number of joint science projects with DUT such as "Applying FACTS in electrical system"; "Load control" as well as collaborated to organize 8 science workshops at DUT. Besides, Prof. Dr. Tran Quoc Tuanis also a consultant for 06 huge programs of Vietnam Electricity corporation. 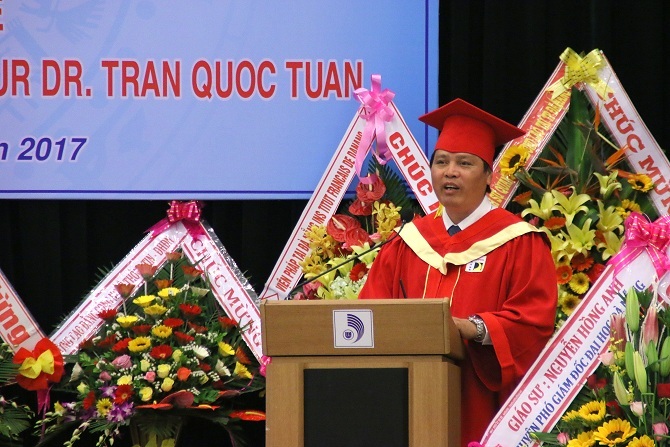 "As an international prestigious scientist in the field of electricity and energy, Prof. Dr. Tran Quoc Tuan has taken an important role in improving the quality of UD's faculty and electrical research activities. 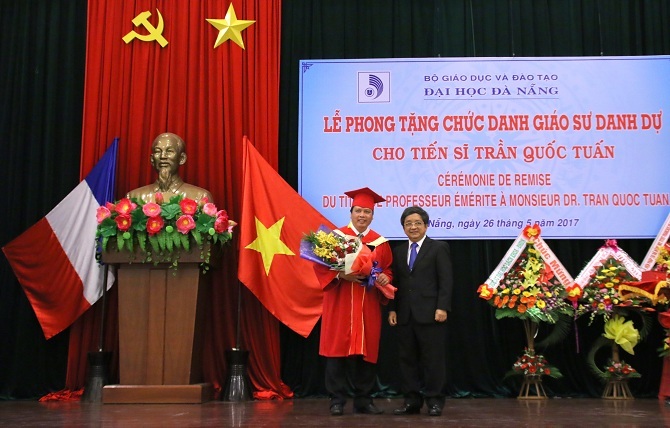 In recognition of outstanding achievements in scientific research, training and valuable contribution to the development of cooperative relationship between UD and France, in April 2017, the Science and Technology Council of DUT and UD agreed to confer the honorary professorate degree on Prof. Dr. Tran Quoc Tuan "- Prof. Dr. Tran Van Nam emphasized at the ceremony. Prof. Dr. Tran Van Nam hoped that Prof. Dr. Tran Quoc Tuan would continue to be a bridge to develop cooperation between UD and research, training institutions in France to a new phase. In recent 5 years, UD's scientific and technological achievements have grown remarkably. Specifically, in 2016, UD had 300 international scientific papers (including 76 articles published in ISI / SCOPUS journals with high ratings). In addition, international cooperation activities has brought the funding with more than 5 million USD to increase the budget for carrying out scientific and technological topics at all levels, technology transfer contracts and international cooperation projects. In order to achieve theseresults, besides basing on the human resources of UD, the assistance and cooperation of individuals and international science and technology organizations are also important. 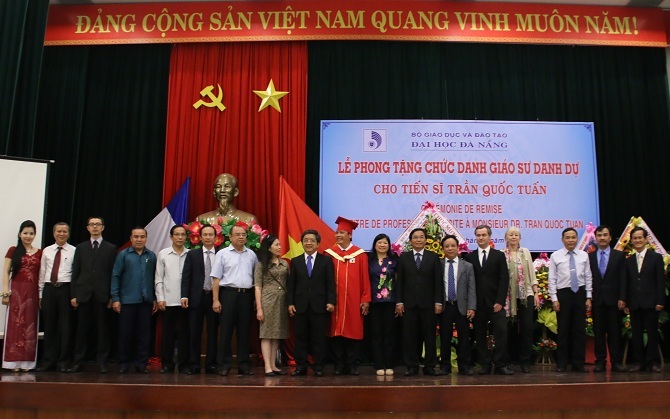 In particular, the cooperation of Vietnamese scientists working in France has brought a lot of outstanding results.